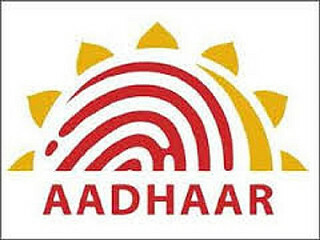 Shubham Khandelwal, from Chennai, has posted his complaint against an Aadhaar operator, on IPaidaBribe.com, leading to the operator being blacklisted. Shubham Khandelwal of Chennai is not your average citizen. He has dutifully gone ahead and taken the trouble to get himself enrolled for the Aadhaar card at an Aadhaar centre in Chennai. Impressed with the government's drive to enrol citizens for the Aadhaar card, he had presented himself at the centre along with his father. However, he had the shock of his life, when the official manning the centre asked him for a steep bribe to give him a receipt. Shubham Khandelwal reported to IPaidaBribe.com that he was asked to pay a bribe of 2000/- by the enrolment officer in Chennai to get his father’s and his Aadhaar receipt. After refusing to pay for three days, he finally gave in and paid Rs 350/- to the officer. Despite this, the officer gave him only his father’s Aadhaar receipt and not his. Shubham Khandelwal in his complaint mentions that after the official told him that he could not give his receipt as 'it was not there' he asked the official to return the bribe money, which was refused. Now, Shubham Khandelwal was peeved by the behaviour of the official and put down his experience on IPaidaBribe.com, and it worked wonders. And he took care to put out the complaint in as detailed a manner as possible. He mentions the name of the officer, and also gives out the name of the company the official belonged to and the mobile number of the person. This adds authenticity to the report, and vigilance agencies take such complaints seriously. 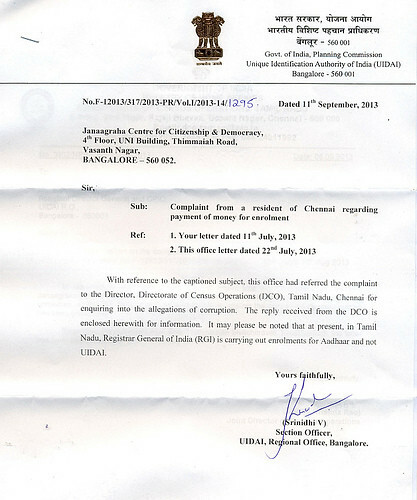 The letter sent from IPaidaBribe.com to Unique Identification Authority of India in Bangalore was received and duly acknowledged by the organisation, and it referred the complaint to the Director, Directorate of Census Operations (DCO) Tamil Nadu, Chennai for enquiring into the allegations of corruption. It also mentioned in the letter that for Tamil Nadu, the Registrar General of India was carrying out enrolments for Aadhaar and not the UIDAI. 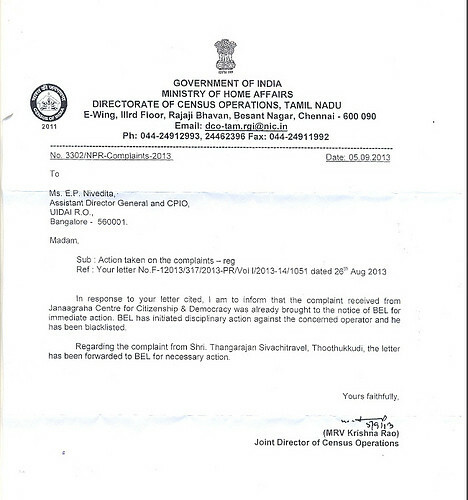 The Directorate of Census Operations, Tamil Nadu based in Chennai took note of the complaint forwarded by the UIDAI from Bangalore, and stated that disciplinary action has been initiated against the concerned operator, Macro Infotech Pvt Ltd and the operator has been blacklisted. Now this is great news that the government departments had acted with such alacrity on a simple complaint and had not only blacklisted the operator, but has also initiated disciplinary action. IPaidaBribe.com not only collects bribe experiences from citizens, but also sends it to officials of the various departments and the vigilance branches of the respective departments. The vigilance departments then take up the complaints on a case to case basis and conduct internal enquiries into the matter. Then, official action is taken. Apart from the vigilance agencies of various departments, the central vigilance agency also intervenes if is a matter of serious concern. Official action might be as drastic as the one taken in the above mentioned case, or it could be just an internal enquiry. But even a mere enquiry at a departmental level damages the career chances of officials. Though nothing might come out of an enquiry, the fact that an enquiry is being conducted is enough to scare officials and make them fall in line. Use IPaidaBribe.com. Speak out against corruption and watch out to see if action is taken.